The Newton YMCA has been blessed by many generous givers over the years — too many to mention here. However, the staff of the YMCA would like to share the story of one gift to demonstrate the positive impact you can have on your community through a financial gift to the YMCA. Nancy and the late EK Shaw of Newton were avid supporters of the Newton YMCA. Each year, former YMCA Executive Director Marv Zimmermann would meet with EK at the local newspaper to discuss a gift to the Y’s Partner With Youth Campaign, and each year the Newton couple made a generous gift. The Shaws decided they wanted to make a large gift and make an impact on the YMCA, its members and the community they loved. The Shaws donated $750,000 to be used to improve the Newton YMCA. In 2011 and 2012, with Nancy Shaw’s blessing, the funds were used to retire debt, establish an endowment and to remodel under utilized space in the YMCA’s main facility to create a state-of-the-art child care facility. In May 2012, the YMCA Child Care Center was opened, and EK and Nancy’s vision of improving the Newton YMCA, community and lives of hundreds for generations came to fruition. Thanks to the Shaws and hundreds of others who choose to financially support the YMCA, the Christian non-profit organization continues to make a positive difference in lives each and every day. Like the Shaws, you too can be a part of a lasting legacy of positive community impact! 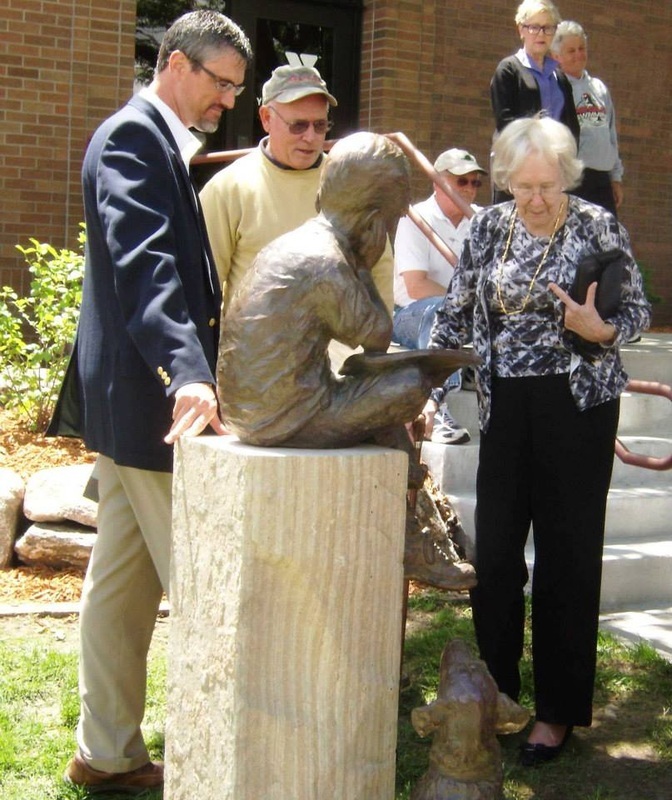 From left: YMCA Program Executive Tom Vanderlaan, artist Nick Klepinger and donor Nancy Shaw enjoy the statue "The Reading Lesson" at the Newton YMCA. The statue was designed by Klepinger and donated by Shaw, in honor of her husband E.K. Shaw. The Shaws donated $750,000 to the YMCA in honor of their longtime friend and former YMCA Executive Director Marv Zimmermann (top photo right). The money was used to remodel the Newton YMCA's child care area and establish an endowment.